The widespread view among the Brexit commentariat – and European Union officials – has been that, while everyone knows what the British Parliament doesn’t want, no one knows what it does want. After three days of voting in the House of Commons last week and less than two weeks until Mar. 29, when, by the terms of the EU’s Article 50 process and its European Union (Withdrawal) Act 2018, the UK will leave the EU, we know more about what it doesn’t want: It still doesn’t want the withdrawal agreement the government negotiated with the EU. And it doesn’t want to leave the EU without a deal. But we still don’t know what it does want, other than an extension of the Article 50 process beyond Mar. 29 of some still-uncertain length for some still-uncertain purpose. The only certainty is that the UK must decide what it wants, in terms of the length and purpose of an extension, by this Thursday, when the European Council meets for the last time before Mar. 29 and must figure out how to persuade all 27 member states that it should be granted the extension. If the Council doesn’t unanimously approve an extension of the Article 50 process at that meeting, the UK will, on Mar. 29 and regardless of last week’s rejection of a no-deal exit, go over the cliff-edge in the hardest possible Brexit – one that would plunge the economy into a deep recession and damage it for years to come. On Jan. 15, the House rejected the 585-page binding withdrawal agreement and the 26-page non-binding political declaration on the framework for the future relationship by an overwhelming margin – 202 in favor and 432 against. It represented the largest defeat suffered by a sitting government in parliamentary history and came at the hands of MPs of the governing Conservative party, 118 of whom voted against the deal along with the 10 MPs of the Democratic Unionist Party of Northern Ireland that (at least in theory) supports the minority government in a “confidence and supply” arrangement. The defeat occurred despite a Jan. 14 letter to the prime minister from European Council President Donald Tusk and European Commission President Jean-Claude Juncker in which they reiterated the assurances given by the European Council in December that the “backstop” – the provisions in the 183-page Protocol on Ireland/Northern Ireland in the agreement that are meant to ensure the avoidance in all future circumstances of a hard border between Ireland and Northern Ireland – was intended only as an insurance policy, that the EU was determined to work speedily on a subsequent agreement that would establish “alternative arrangements” so the “backstop” would not have to be triggered, and that, if it were nevertheless triggered, it would apply only temporarily until it was superseded by a subsequent agreement that ensured the avoidance of a hard border. On Feb. 27, the House approved by unanimous voice vote an amended motion put forward by the government that noted the prime minister’s statement the previous day that, while the discussions between the UK and the EU were still ongoing, there would be a second “meaningful vote” by Mar. 12 on the withdrawal agreement and political declaration; that if they were not approved by that date the House would be asked on Mar. 13 whether it wished to leave the EU without a deal on Mar. 29; and that, if it rejected leaving without a deal on Mar. 29, the House would be asked on Mar. 14 whether it wanted to seek a short limited extension to Article 50 and bring forward the necessary legislation to change the exit date to one commensurate with the extension. The EU-UK negotiations, completed late in the evening of Mar. 11, produced a legally-binding joint interpretative instrument that provided “a clear and unambiguous statement by both parties to the Withdrawal Agreement of what they agreed in a number of provisions of the Withdrawal Agreement, including the Protocol on Ireland/Northern Ireland” and a joint statement supplementing the political declaration setting out the framework for the future relationship. In addition, the UK issued a Unilateral Declaration in which it noted that the provisions of the Protocol are intended to apply only temporarily and noted as well its understanding that nothing in the agreement would prevent it from instigating measures leading to the “disapplication” of its obligations under the Protocol in the event it became impossible for the UK and EU to conclude an agreement in regard to the future relationship because of a breach of the agreement by the EU. While the joint instrument conveyed in legally-binding form the EU’s assurances that the “backstop” was meant to be temporary, that it hoped it would not have to be triggered and that, if triggered, it would exist only until alternative arrangements to keep the Irish border open took effect, the fact remained that the EU had not reopened negotiation of the agreement, the “backstop” had not been replaced, it was not time-limited, and there was no unilateral exit mechanism. For the hardline Conservative opponents of the deal in the European Research Group, along with the DUP, the key question, then, was whether the documents would allow Attorney General Geoffrey Cox to reverse the legal advice he had given the government about the “backstop” in November. In that advice, made available to the House in December only after it held the government in contempt for refusing to release it, Cox said the Protocol “would endure indefinitely in international law and could not be brought to an end in the absence of a subsequent agreement,” even if the parties were negotiating many years later and even if they believed that the talks had broken down and there was no prospect of agreement about the future relationship. He had further noted that, even if the situation was due to the EU’s lack of good faith and “best endeavors” in negotiating, because of the difficulties of proof needed to establish a breach by the EU of its obligations, it would be highly unlikely the UK could take advantage of the remedies in international law available in such a circumstance. 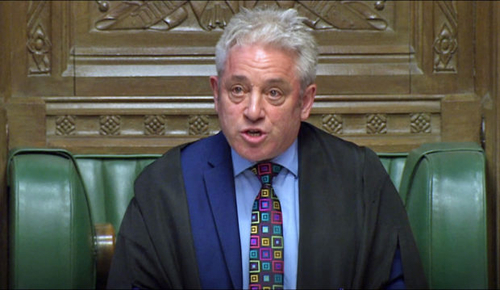 Later that day, the House voted again on the withdrawal agreement and the framework, and again, as on Jan. 15, it rejected them by a decisive margin – 242 in favor and 391 against. The margin of defeat – 149 votes – was not quite as large as in January. But it was nevertheless a massive defeat for the prime minister and her government. And again, as in January, the defeat resulted from the refusal of a significant number of Conservative MPs – 75 – as well as the 10 DUP MPs to vote for the deal. Had the 75 Tories voted for it, the deal would have been approved. On Wednesday, Prime Minister May put forward a motion that the House declined to leave the EU without a withdrawal agreement and a framework for the future relationship on March 29, which of course would leave open the possibility of leaving without an agreement and framework on some other date. A cross-party amendment which removed the date and inserted instead a blanket rejection of leaving without an agreement and framework was adopted by a narrow margin of 312 to 308 – in part, because nine Conservatives voted for the amendment and four ministers abstained. The prime minister’s motion, amended to include the blanket rejection of leaving without a deal, was then adopted by a vote of 321 to 278. Despite a three-line whip, meaning vote as the party directs or else, 17 Conservatives, including one minister who resigned, voted for the amended motion while 29 others, including four Cabinet members and nine other ministers, abstained, refusing to vote, as the party directed, against the motion. Normally, those who abstained despite a three-line whip would be required to resign from the government, but because of confusion among the whips over the party’s position in regard to the initial motion, the amendment, and then the amended motion, there were no resignations, other than by the minister who voted for the amended motion. On Thursday, the prime minister put forward a motion that the House noted the earlier votes and accordingly agreed that the government would seek an extension from the EU of the Article 50 process, that if the House approved the withdrawal agreement and framework for the future relationship by Mar. 20 the government would seek an extension to June 30 in order to pass the necessary exit legislation, and that if it has not approved the agreement and framework by Mar. 20 it is highly likely the European Council, at its meeting this Thursday, would require a “clear purpose” for anything other than a short “technical” extension and that any extension beyond June 30 would require the UK to hold European Parliament elections in May, since the UK would still be a member of the EU when the new Parliament convened in early July. The House approved the motion by a vote of 412 to 202. But as has become customary in the Brexit votes, the Conservatives were deeply divided: 112 voted in favor but 188 voted against the motion, notwithstanding the fact that it had been put forward by the prime minister. Especially noteworthy was the fact that eight members of the Cabinet, including, among others, Andrea Leadsom, the Leader of the House of Commons, Liam Fox, the Secretary of State for International Trade, and, perhaps most notably, Stephen Barclay, the Secretary of State for Exiting the EU, who had introduced the debate on the motion on behalf of the government and had recommended it to the House, voted against it. Sir Graham Brady, not a member of the government but the chair of the Conservative backbenchers’ 1922 Committee, voted against the motion as well, sending an unambiguous signal to the backbenchers that it was acceptable to oppose the government’s motion. Jeremy Corbyn, the leader of the Labour party, has often characterized the government’s performance in the long-running Brexit saga as “shambolic.” Certainly, the performance of the government in the critical votes last Wednesday and Thursday, when Cabinet members and other ministers defected from the government’s positions, warranted that characterization. It’s one thing to have a party that is deeply divided over Brexit, as the Conservatives have been for some time and are today, have some of its members defect from the positions taken by the leadership in regard to that issue. But it’s something else altogether to have a government which doesn’t speak with one voice in support of its positions and in which some members refuse to support the position of the prime minister. The defections in last week’s votes, especially in Thursday’s vote, reflect more than chaos and disorganization; they reflect the extent to which the prime minister’s authority, not only within her parliamentary party but within the government and Cabinet as well, has been eroded over the course of the long-running Brexit saga. In the wake of last Tuesday’s rejection of the withdrawal agreement and the overwhelming support for Thursday’s motion that suggested a third “meaningful vote” on the agreement by Mar. 20, the prime minister has been considering whether to ask the House to vote yet again this week on the agreement. As the motion stated, if the House approved the agreement, she would ask the EU27 on Thursday for a short “technical” extension to June 30. Obviously, approval by the House and an extension to June 30 would be her preferred outcome – but only if she were certain, based on discussions with the opponents of the deal in the Conservative Party and the DUP, the deal would be approved. By this morning, it seemed possible the DUP might agree to support the deal but there were still roughly two dozen or more Conservatives who remained opposed – enough to defeat the agreement a third time. In all likelihood, a third defeat would prompt Corbyn to call another vote of no confidence. Perhaps, then, there was a quiet sigh of relief in 10 Downing St. this morning when the Speaker of the House, John Bercow, issued a statement in which he ruled that, in accordance with long-standing parliamentary convention dating back to 1604 that the same motion can’t be brought forward for consideration a second time in the same parliamentary session, the House can’t vote again this week on the withdrawal agreement. While it could, he said, vote on the agreement last week for a second time after having rejected it on Jan. 15 because it had been changed through the attachment of additional documents, including the legally-binding joint instrument negotiated by the UK and EU after the Jan. 15 vote, it can’t vote on the agreement again this week because it has not been substantially changed – or, indeed, changed at all – from the version rejected last week. There is obviously no time left in which to negotiate substantial changes in the agreement and, in any event, the EU has made it very clear, prior to the Speaker’s ruling, that it has no interest in any further discussions about the withdrawal agreement; as Juncker put it last Monday evening in his press conference with the prime minister, while there are second chances in politics, there are no third chances. All of which means that at Thursday’s meeting of the European Council, Theresa May will, of necessity, have to ask the EU27 for an extension of the Article 50 process that goes well beyond June 30 – probably at least until the end of 2019 and possibly, as Donald Tusk has suggested, until the end of 2020. But before approving a lengthy extension the leaders will want to know for what purpose is the UK seeking the extension. The UK has 72 hours to come up with an answer.